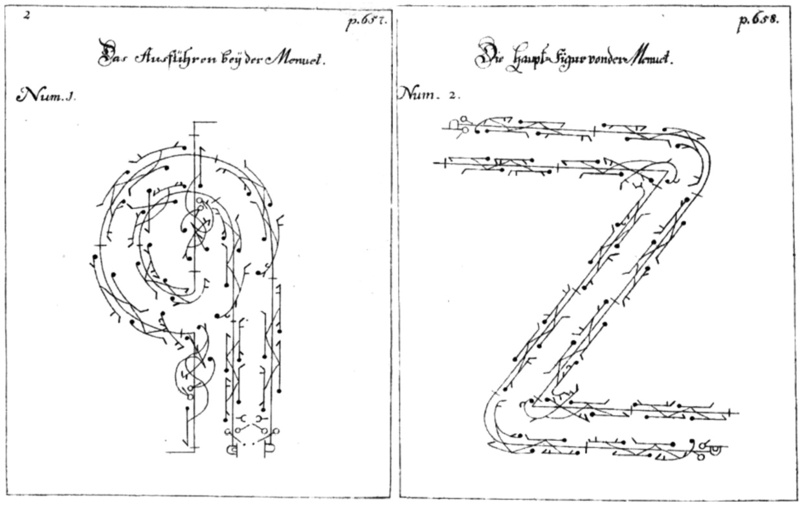 Gottfried Taubert’s Rechtschaffener Tanztmeister, oder Gründliche Erklärung der frantzösischen Tantz-Kunst (Leipzig: Erben, 1717) is an encyclopedic—even cosmological—work on early eighteenth-century dance, and the minuet is at the center of its universe. Providing what is probably the most complete and accurate description of the dance of all time, Taubert discusses the minuet step, its cadence, its principal and collateral figures, the giving of hands, and the cavalier’s conduct of his hat, ending with a full description—both in words and in five notated choreographic figures—of a complete minuet ordinaire. Throughout, his information is based on French authority and follows the central French tradition; it is not a provincial German account. This according to “The minuet according to Taubert” by Tilden A. Russell (Dance research XXIV/2 [winter 2006] pp. 138–162). Below, a brief demonstration that includes the cavalier’s conduct of his hat.